Here we go again on Fishing in the Discount Bin. I watch a movie I own and blog about it. Simple as that. 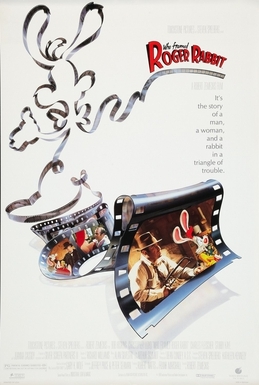 This time out, we're doing Who Framed Roger Rabbit. This is in my notes at February 17, 2018. There was a challenge on Twitter to go scrolling back through your Amazon purchase history and find the first thing you ever bought on Amazon. I decided to do that, and discovered that the first thing I bought on Amazon was a Robert Zemeckis lovefest. It was The Back to the Future Trilogy and Who Framed Roger Rabbit on DVD, back in June of 2003. Since I've already done Back to the Future for this series, I figured Who Framed Roger Rabbit was worth the revisit. Ah, Who Framed Roger Rabbit. The #1 movie of 1988. Still held up by film historians, animators, and special effects artists as the most seamless blend of animation and live action ever committed to the screen. It picked up three Oscars and a special technical achievement Oscar for animation director Richard Williams. Considered by many to mark the beginning of the Disney Renaissance period in animation, as Disney poured serious money back into their animation unity in order to handle the animation. Not only that, many point out that the film holds up really well, and the divide between humans and toons has been embraced as an allegory for the racial divide in the entertainment industry in the 1940s. Robert Zemeckis directed. This was his follow-up to Back to the Future. Zemeckis admits on the running commentary that the main thing that drew him to the project was the immense technical challenge. Specifically, the opening scene, where the camera pulls back, and we see the cartoon is a set, just like a regular movie, and the live-action director starts barking orders to the animated Roger Rabbit. Says Zemeckis, "If you could make the audience believe that, then they'll believe everything else in the film." Little side note: Monty Python alumnus and director Terry Gilliam was Steven Spielberg's first choice to direct the film. Gilliam has said in interviews over the years that he was actually frightened off by the technical challenges the film possessed, and it's grown into one of his biggest regrets. Ah, yes, and Steven Spielberg was the producer. Who else but Spielberg at the height of his power and fame would be able to broker a deal between the various animation studios to get Disney characters and Warner Brothers characters in the same film? The negotiations were legendary. For the famous Bugs Bunny and Mickey Mouse scene, the deal was brokered so that the two cartoon stars would have exactly the same amount of lines and be on screen for the same amount of frames...they would be there completely equally. Hollywood, 1947. Bob Hoskins is private eye Eddie Valiant. Valiant once had some fame and was held in high regard for cracking several high profile toon cases (one headline in his scrapbook reads "Goofy Cleared of Espionage Charges," and I kinda wanna see that prequel. ), but ever since his brother and partner was killed by a toon, Valiant has lost himself in a bottle. Valiant is hired by cartoon mogul R.K. Maroon, for what Valiant calls "a simple snoop job." Roger Rabbit has been off his game lately, leading to production delays on the latest Roger Rabbit cartoon. Maroon suspects that it's because Roger suspects that Roger's wife Jessica has been fooling around. Valiant's case: get the evidence that she is or isn't, so Roger's mind will finally be put at ease. Well, Valiant gets the evidence -- gadget magnate Marvin Acme is literally playing patty cake with Jessica -- and the pictures lead Roger to charge off into the night in a jealous rage. The next morning, Acme is found dead, and all evidence points to Roger. Roger Rabbit soon shows up at Eddie's office, claiming innocence and asking Eddie to help clear his name. Throw in the fact that Acme was the owner of Toontown -- the community where all the toons live -- and his will has gone missing, and it looks like we have a conspiracy at play, with Roger as the patsy. And so, Eddie is sent down the path of redemption, as he seeks to learn who framed Roger Rabbit. The amazing thing is that the film really does hold up. Bob Hoskins really sells it. I mean, this really did establish the pattern of many special effects films today, with "react to something that will be animated in later," and Hoskins pulls it off remarkably. And of course, the animation is great. The voice acting is phenomenal, especially with comic Charles Fleischer as Roger Rabbit. An uncredited Kathleen Turner just oozes sexuality as Jessica Rabbit. According to legend, Turner agreed to go uncredited so Jessica would stand on her own as a character, but it wound up being the worst-kept secret in Hollywood. And of course, the sad footnote that this was the final time that voice acting legend Mel Blanc voice Bugs Bunny before his death in 1989. Frequent Zemeckis collaborator Alan Silvestri does the score. It does sound a lot like his Back to the Future score in places, but he's able to throw in some of the 1940s private eye jazz and emulate the cartoon scores of the era when he needs to. It's good stuff. Who Framed Roger Rabbit is still completely worthy of its renown. Check it out again, if you haven't in a while.